We ensure that through our school aims, agreed class charters, curriculum and teaching, we promote respect and tolerance for all cultures, faiths and lifestyles. As educators we have a duty to prepare our children for life in the Britain of today and to keep them safe. We value the importance of and support the current Ofsted guidance. •We have an elected school council who represent all year groups. In their half termly school council meetings they discuss and vote on decisions that will impact the school. The children learn about representation, its importance and meaning; how to organise the agenda and chair a meeting and the value of having a voice. •The children learn the vocabulary related to democracy such as representation, nomination and voting. •Democracy is taught about and discussed in PSHE lessons and assemblies. •Our robust history curriculum teaches how British history has helped to shape modern Britain and its values. •We have high expectations of pupil conduct, reflected in our Behaviour Policy and which is clearly evident to visitors of the school. •We have a clear behaviour protocols in place,that are followed by all members of staff from teacher to support staff and midday supervisors. The children understand the procedures in place, and what will be the consequences of their actions. •A key part of our Behaviour Policy is allowing children time and opportunity to reflect upon their behaviour, what they need to do to change their behaviour in future and to whom, if appropriate, they need to apologise. •Through the agreed Classroom Rules and PSHE lessons, children are taught to know right from wrong, how to keep themselves safe and to do the right thing, even when it is difficult. •Visits from other authorities such as the Road Safety Team, Fire Service and Ambulance features in our calendar and help reinforce the message of the consequences if rules are broken. •When relevant we work closely with the local authority about specific behaviour concerns such as the Behaviour Support team. UN CRC Article 31: All children have a right to relax and play, and to join a wide range of activities. •Through assemblies and PSHE sessions, children are taught about personal responsibility, choices, ambition and aspiration. •Children throughout the school are encouraged to make independent decisions, for example in choice of lunch and playground. •We offer a range of free clubs for all ages to allow children to have the opportunity to follow their interests in art, music, sport and so on. •Through the PSHE and computing curriculum, as well as through visits from the police, road safety and cycling organisations, children are taught how to keep themselves safe in the physical and online world. UN CRC Article 2: The Convention applies to everyone, whatever their race, religion, abilities, whatever they think or say and whatever type of family they come from. •We have high expectations about pupil conduct and this is reflected in our Behaviour Policy and Equality Policy. •Children are awarded with stickers for behaving in kind, respectful and a polite way at play times. They earn House Points for behaviour as well as for effort and achievement. •Through their PSHE lessons and assemblies children are taught and given opportunity to develop their understanding of the importance of cooperation, collaboration and to be supportive, understanding and appreciative of difference. Children also learn this through PE lessons with our dedicated PE teacher. •Play leaders from Year 6 receive training to support the play of children from KS1. •Our Equality Policy clearly states our view on the importance of respecting difference in whatever form that difference might take. •Education, understanding and awareness of different faiths and beliefs is fundamentally important to us. Tolerance and understanding is taught and promoted through the Locally Agreed Syllabus for Religious Education. •Class, key stage and whole school assemblies also promote tolerance and we have regular visits from local religious leaders. •Significant religious festivals such as Diwali and Ramadan are studied and celebrated, and talks have been given by staff and parents from different faiths. 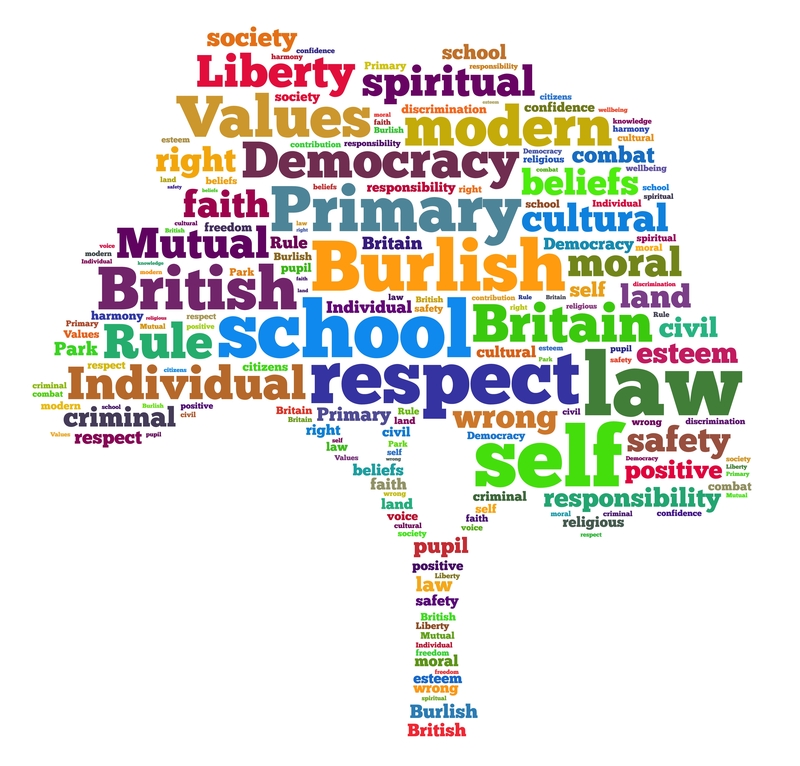 We also celebrate British Values in action by encouraging the children to nominate their peers when they see them demonstrating an example of British and Burlish Values.